An unaltered photocopy of your DD-214, WD AGO 53-55, or other military issued document clearly displaying your award of the Coast Guard DSM. Contact The War Library if you do not have a DD-214, WD AGO 53-55, or other military issued documentation authorizing your award: 1-562-422-4100 (Pacific Time Zone). The Coast Guard Distinguished Service Medal was established by Act of Congress (Public Law 207, 81st Congress), approved August 4, 1949. 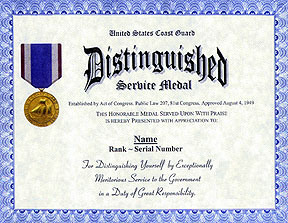 The Coast Guard Distinguished Service Medal has been in effect since August 4, 1949. The Coast Guard Distinguished Service Medal is awarded to service members who, while serving in any capacity with the Coast Guard, distinguish themselves by exceptionally meritorious service to the Government in a duty of great responsibility. The Coast Guard Distinguished Service Medal is worn after the Transportation Distinguished Service Medal and before the Silver Star. Additional awards of the Coast Guard Distinguished Service Medal are denoted by Gold Stars. The Coast Guard Distinguished Service Medal was designed and sculpted by Thomas Hudson Jones (1892-1969) of the Army's Institute of Heraldry. Admiral Alfred C. Richmond, Commandant of the Coast Guard, received the first Coast Guard Distinguished Service Medal. 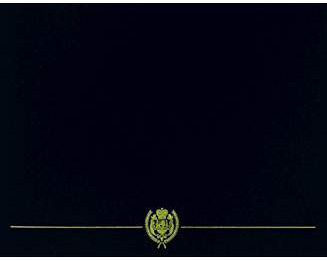 It was presented to him by the Secretary of Transportation on February 1, 1961. In the center of a gilt disc there is a representation of the U.S. Revenue Cutter Massachusetts under full sail on a moderate sea. In a circle surrounding the ship are the words, U.S. COAST GUARD in the upper portion, and DISTINGUISHED SERVICE in the lower. The Massachusetts was built in 1791 and was the first Revenue Cutter. As the forerunner of a long line of similar vessels which rendered distinguished service to U.S. Maritime history, it was considered to be a fitting symbol to use on this medal. In the center of a gilt disc, the seal of the Cost Guard, and below the seal (and following the lower contour of the medal), a streamer upon which the recipient's name is to be engraved. The ribbon to the Coast Guard Distinguished Service Medal consists of a central stripe of grotto blue bordered on each side by a pinstripe of white. the ribbon is edged in purple.